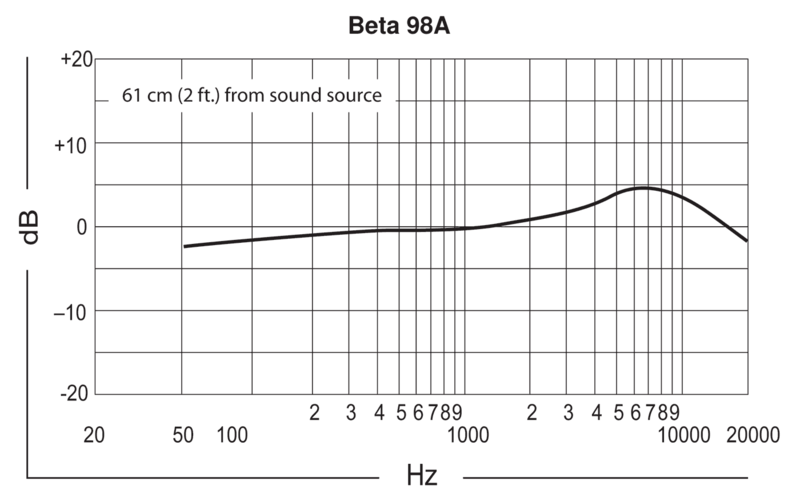 The Beta 98AMP is a variation of the company’s Beta 98A compact condenser. The 98AMP retains the 98A’s electret capsule (Shure p/n RPM98A/C), but moves the built-in preamp to a separate housing, to which the capsule is attached via a gooseneck. The capsule head is small enough to make positioning easy, even in tight quarters such as toms on a drum kit. The specs for the 98AMP differ slightly from the 98A. The Beta 98AMP ships with Shure’s new A75M Universal Microphone Mount (a drum rim clamp), a mic clip, a zippered pouch (Shure p/n 95A2314), and a “snap-fit” windscreen (p/n 95A2064).